While there are plenty of retinol cream reviews online - usually from big companies promoting their own products – this review is about my personal experience using some over-the-counter drugstore brands and popular online retinol products (including face creams, eye creams, and serums). 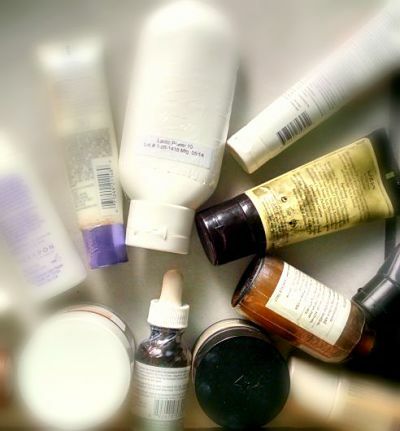 Note: This review is only about over-the-counter retinols. I’ve tried prescription retinoids (like Retin-A and Renova) in the past and really didn’t care for them. The break-in period was brutal for me because they made my skin too dry and irritated. I first started using retinol cream mostly to target the lines under my eyes. I’ve had puffy eyes since my teens and when I turned 30 something, I started developing lots of wrinkles and fine lines under my eyes due to the constant skin stretching each time my eyes puffed up. I started with this one first because it looked like it could target all of my issues, sensitive skin, puffiness, and wrinkles. The cream felt very nice and soothing and it absorbed quickly, but after several tubes (about 3 months) I didn’t notice any changes to my skin. I eventually bought the next stronger retinoI cream that Roc made. Again, it felt very nice, absorbed quickly but no change at all. And I used this retinol cream for almost a year! Since over-the-counter retinols are much weaker than their prescription cousin, if it’s going to work you should see some improvements within about 6 weeks. My Review – If you’re in your 20s and 30s, I think ROC Retinol creams are a good choice and may even help prevent deeper lines from forming as you age. The creams have a nice texture……not too heavy, not too greasy and enough hydration. But once you’re over 40, I think a stronger, more potent retinol cream is needed. While ROC does not state the percentage of retinol in their skin care line, I noticed the main ingredient - retinol - is listed 3rd or 4th from the bottom which means it doesn’t contain very much retinol. NOTE: I didn't bother trying the other popular drugstore brand retinol creams because most contained Pro Retinol (which include: retinyl acetate, retinyl linoleate, retinyl palmitate and retinyl proprionate). These are older, weaker forms of retinol and do not have the same anti-aging effects as current retinol. Now that I’m in my 50s I decided my entire face and neck (not just my eyes) could use the anti-aging benefits of Retinol. I never like the feeling of lots of gooey, heavy creams on my face– especially in the hot summer months. So thought I’d try a simple serum. But which one to try? Since I’m a fan of Zenmed products, I thought I’d try the Retinol Booster Serum. It’s clean, absorbs well and I can use it under my eyes without worry about causing puffiness because it does not contain any oil. Plus, I can layer the serum under my favorite cream or use it alone with just sunscreen. Note: The retinol serum not be suitable under the eyes for everyone. But I’m just sharing what I do. If you decide to try it under the eyes, test a small area out first!! My Review - It took about 2 1/2 months, but I am starting to see some visible results in skin tone and a slight softening of fine lines. The pores around my nose and lower cheeks seem a bit smaller too…. giving my skin smoother almost porcelain look. I am definitely using less makeup foundation. Now I’m curious and anxious to see what other results I’ll see in a few more months. I read somewhere that when using over-the-counter retinols the beneficial results seem to plateau after about 6 months or so and some people may need to move up to a stronger formula. That’s why I was interested in trying the Retinol Skin Repair Serum 2.5% . The description says serum, but it's more like a cream. Very soothing and at a great price point! They even offer FREE SHIPPING! My Review - Don’t let the creamy texture fool you. This stuff is potent! Even if you’ve been using retinol creams for a while, you should start out using it a few times a week until you see how your skin adjusts to it. Even though if feels creamy, so I did not need a moisturizer on top. I started out using it only a few times a week and I experienced a tiny bit of flaking around my nose and chin. But, after a few months everything smoothed out and my skin tone looks more even. Even my freckles were less visible - so I think it really helped exfoliate dead cells. I think this serum is more hydrating because it contains a nice cocktail of hyaluronic acid along with palmitoyl pentapeptide and acetyl hexapeptide. If you have super sensitive, dry skin, this might be a good starting point for you. My Review - I really can’t say how effective this is yet since I'm on my first jar. But it is more expensive than Zenmed Booster Serum or the 2.5% Cream Retinol. For now, I’m happy with the Retinol Booster Serum during the summer and the 2.5% Retinol Repair cream for the winter because it feels creamier than a serum. And, a few times a year, I layer the two products together for extra oomph in my retinol therapy. Or at least until something even better comes along. Got any suggestions or experience with retinol creams/serums. Please send me your retinol cream reviews - I'd love to share them with everyone.